Exploration, missions, science fiction,?and lots of good laughs?that what’s The Orville is all about. Scroll down below to find out how you can catch up to the latest season of the Star Trek-inspired comedy series. The Orville is a sci-fi comedy-drama series created by Seth MacFarlane for commercial television network FOX. It stars Seth MacFarlane himself as Ed Mercer, an officer in the Planetary Union whose life takes a downturn after his divorce. He is given command of the Orville spaceship only to discover that his ex-wife Kelly Grayson (Adrianne Palicki) has been assigned as his first officer. The series is inspired by several sources including the Twilight Zone and Star Trek. It’s centered on the journey of both Mercer, Grayson, and their crew as they embark on various missions around the universe. The show is currently in its 2nd season which premiered on December 30, 2018, to favorable reviews, including a 100% approval rating on Rotten Tomatoes. You can watch The Orville on Thursdays at 9/8 c on FOX. If you don’t have a cable subscription or FOX is not available in your region, don worry. We got you. Scroll down below for our recommendations – both official and unofficial – on how you can stream The Orville online. Watching The Orville on FOX is easy for US residents with a cable subscription since FOX offers all episodes of The Orville on its website. Just enter your TV provider credentials then click on the episode you want to start watching! The official website also includes special clips and extra behind-the-scenes footages, so you can get in a few more laughs after watching the individual episodes. The FOX NOW app is also available on iOS and Android, so you can stream The Orville on-the-go, anytime. Bad news for non-US residents though, as this content is restricted only to those living in the US. In case you didn’t know, you can use a VPN to bypass this restriction. FOX Pricing: Same price as your cable TV provider (you’ll be using it to access the content on the FOX website and FOX Now app). Watching on FOX can be a bummer especially if you don’t have a premium cable subscription. Luckily for you, the sci-fi comedy is also offered on Hulu. The 2 seasons of The Orville are all available on the platform, with recently aired episodes updated right away. So this alternative packs a punch. It also comes with a 30-day free trial, so it’s perfect if it’s your first time trying it out. However, Hulu is only available in the US so you’ll need the help of a VPN to access the content. Hulu Pricing: $7.99/month (with ads); $11.99/month (ad-free). If you have an Amazon Prime subscription, then you can add Amazon to the list of your alternatives. Unlike the previous two options, Amazon lets you buy the episodes – either bundled or individually, in SD or HD. It’s pretty cool especially if you’re planning to go on a trip and you want to watch it on the road. There’s also a 30-day free trial in case you don’t have Amazon Prime. Yet again, if you’re not residing in the US, streaming on Amazon Prime Video will still be a problem. You might be able to purchase the episodes, but you won’t have the option to stream them instantly without buying them. You can unlock these restrictions with a VPN. Just skip down below to find out how. Amazon Prime Pricing: $2.99/$1.99 (HD/SD) per episode; season 1 for $9.99; season 2 for $24.99 (includes a season pass). If you’re residing in the U.S., another platform you can consider is Apple iTunes. It’s a good alternative especially if you have an Apple device. Perfect for those nights where you just want to sit on your couch with your mobile phone or tablet. In addition, it lets you download the episodes so you can save them for later viewing. Truly convenient. Not a U.S. resident? No problem. Just make a U.S. iTunes account then you’re good to go. 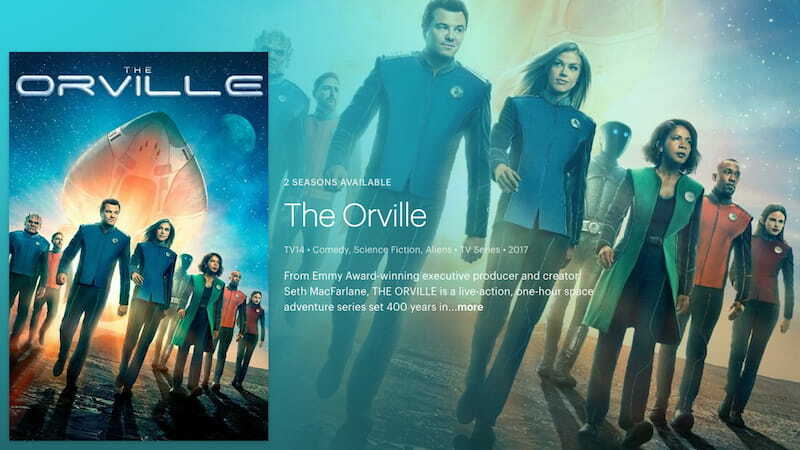 If you want a premium streaming experience and the previous ones we mentioned are a no-go, then try watching The Orville on Vudu. It offers the same services as the others but at a slightly different and reasonable price point. Talk about good stuff. Like iTunes, it lets you download the episodes individually on SD or HDX so it’s a very promising, underrated platform. We get it. You don’t want to spend your money on premium streaming subscriptions or you’re too occupied to make an account. 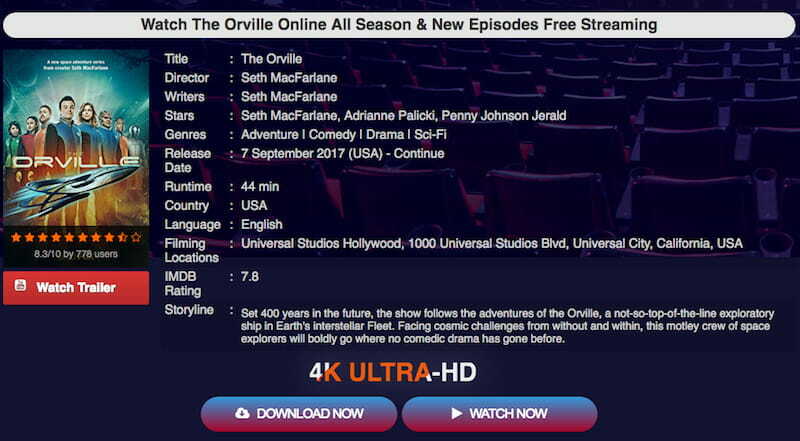 That’s why we will also give you some unofficial ways to stream The Orville online. YouTube and Dailymotion’s copyright infringement policies will not allow you to stream The Orville on their sites. If you’re searching for better alternatives, then Moviecafe can be first on your list. It’s a popular streaming site which is the most recommended on the list of “where to watch series online free” or “where to watch episodes free” on Google. But since it’s unofficial, you are required to make an account before you start streaming. We recommend that you use a fake email to register for your privacy and security. If you’re too lazy to make an account, consider Openloadfreetv as another alternative. It’s also on the list of sites recommended by users for streaming. And unlike Moviecafe, you don’t need to register an account to start. 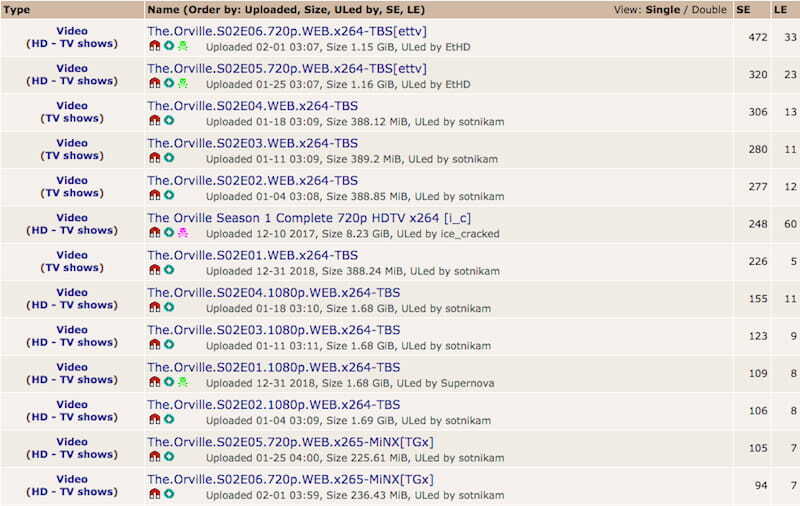 Just go to the site, type “The Orville” on the search bar, then click on the episode you want to watch. But remember that since this is another unofficial streaming site, you might be required to watch an ad which lasts for about 30 seconds to a minute before you can actually watch the episode. Also, watch out for broken links. If you’ve tried both and it still won’t work, then go to Google. Type “watch the orville series online free” or “watch the orville episode 1 online free” to find the particular episode of The Orville you are looking for. And as always, if you’re required to click on every link you could possibly find on different sites, you risk exposing your computer to different malware and viruses. We recommend turning your AdBlocker on for an added layer of safety or better yet, subscribe to a premium VPN which offers the same protection to prevent malicious interference on your browsing experience. We do not condone piracy or torrenting of copyrighted shows since it is illegal. It might be legal for to you download an episode for the sake of keeping a copy, but if you open it for sharing, it becomes illegal. Another thing is that aside from breaking the law and being liable to pay a fine, you risk opening your network to persons who can pry on your privacy and compromise your security. Do yourself a favor and take the time to learn how a VPN works to prevent ruining your Internet experience. Alternatively, if you still want to torrent, then you might want to check out our list of best VPNs for torrenting. It can be super annoying to subscribe to a premium streaming service only to find out that your favorite TV show is not available in your region. Hulu’s black screen of streaming death. It’s a waste of both money and time. That’s why there are VPNs–they make your streaming life easier. Because of FOX’s deal with Hulu, The Orville is only available on streaming services in the US with few exceptions, if any. But with a VPN enabled, you can watch The Orville on streaming services that allow access to US users only, even if you’re outside the region. That said, not all VPNs do the job. Most don’t work and are easily detected by streaming platforms. That is why we’ve recommended our two favorite premium VPNs that can get the job done. ExpressVPN is a favorite among streamers due to its fast speeds, server choices (over 90+ countries), and of course, its ability to unblock Netflix, Hulu, and other streaming services. Not only does it unlock geo-restrictions, but it also has an excellent 24/7 customer service–which is ideal for those just starting out. With ExpressVPN, you can stream The Orville anytime, anywhere. It even includes torrenting support. Talk about value for money! With $8.32/month for a year, think of all these services you’ll be getting. It’s a lot less money to spend compared to subscribing to a premium cable service and costs just as much as you’d pay for a streaming platform like Hulu. If you’re looking for a premium VPN that you can use in the long run that’s budget-friendly, go with NordVPN. It’s our top-rated VPN and a popular alternative to ExpressVPN. Why? It’s basically the same service at a different price point, minus the stellar customer support and slightly fewer countries available (60+ is still a lot). At $2.99/month for a 3-year subscription, it doesn’t get any better than this. You’ll be unblocking geo-restricted content for a long time to come! If you found this guide useful, grab some popcorn and sit on your couch to start your streaming experience! Season 2 of The Orville is currently on air, but it won’t do you any harm to check out the previous episodes to know what’s cooking on the spaceship! Remember that you can always use your VPN to unlock geo-restrictions on streaming sites. Unlike torrenting, it’s not illegal to use a VPN and you can support your favorite shows by accessing them through legitimate means. Are you ready for non-stop comedy with a touch of sci-fi? Start streaming now!